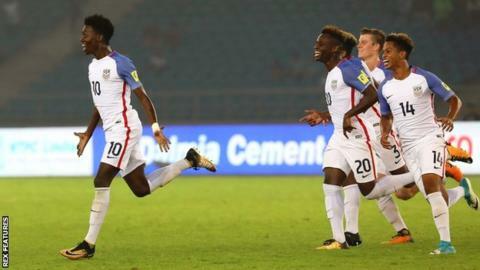 Timothy Weah (left) helped the USA progress to the quarter-finals of the U17 World Cup. When you are the son of a former Ballon d'Or winner, it is likely you would be pretty handy in front of goal. And it looks like legendary former AC Milan striker George Weah has passed some of his skilful genes on to his son, Timothy. The New York-born 17-year-old, who has been signed by Paris St-Germain, scored a hat-trick for the United States at the Under-17 World Cup in their 5-0 win over Paraguay. His second strike in particular, a brilliant curling effort from the edge box into the top corner, was reminiscent of his father - who scored a memorable solo goal for Milan against Verona in 1996. Weah Sr also played for Monaco, Paris-St Germain, Chelsea and Manchester City in a glittering career that saw him named world player of the year in 1995 - the first and so far only African player to win the award. Now 51, he is currently in the running to be elected president of his native Liberia. But his son is now making a name for himself. "At this age he has a lot of potential," US coach John Hackworth told ESPN. "He is one of those guys who you can say has a lot of lofty expectations on him because of his name. But he isn't his dad, he is Tim. "He needs to make his own way. This tournament can be an opportunity for Tim to make a name for himself and maybe we stop talking about his dad in the background." Timothy said after Monday's match, which booked a place in the quarter-finals for the US: "There isn't a lot of connectivity in Liberia so I couldn't text my father. I texted my mom. "She told me to get down on my knees and thank God for scoring a hat-trick and now focus on my next game."